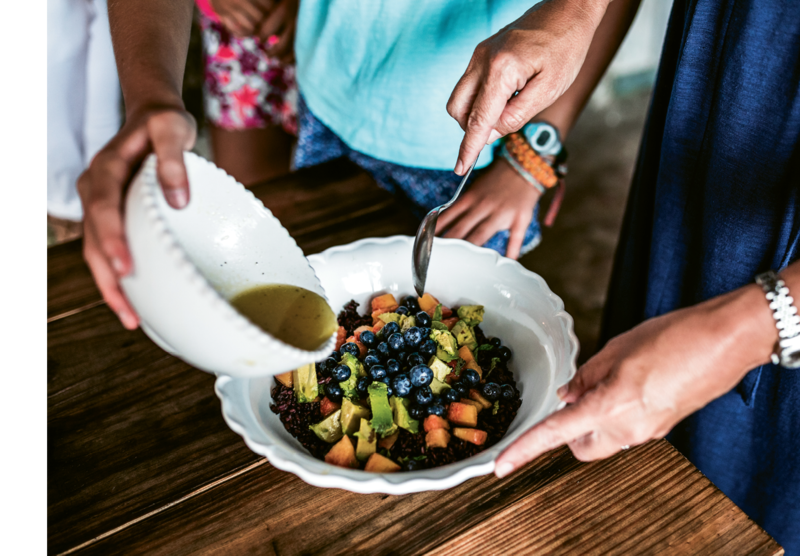 The dinner sides are composed of classic and new flavors: old-school Vidalia onion pie shares the plate with a fresh green salad and black rice tossed with mango. 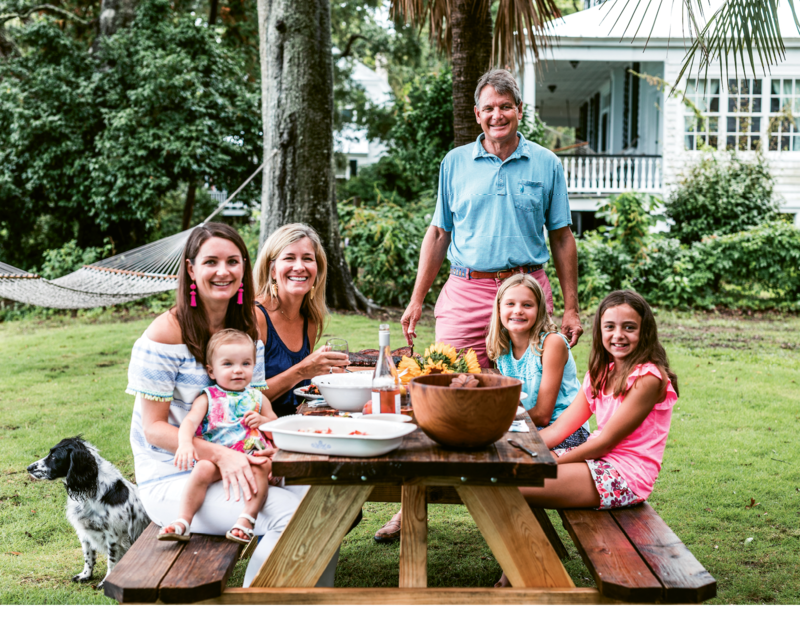 Jimmy Hagood, his wife, Anne Marie, and daughters Catherine and Mary Neill (with granddaughter Louisa) gather with friends on the river. Hagood advises slicing the ribs in one- to two-bone pieces, letting the bone guide the knife rather than cutting down the center of two bones, to provide a full “section” of meat. 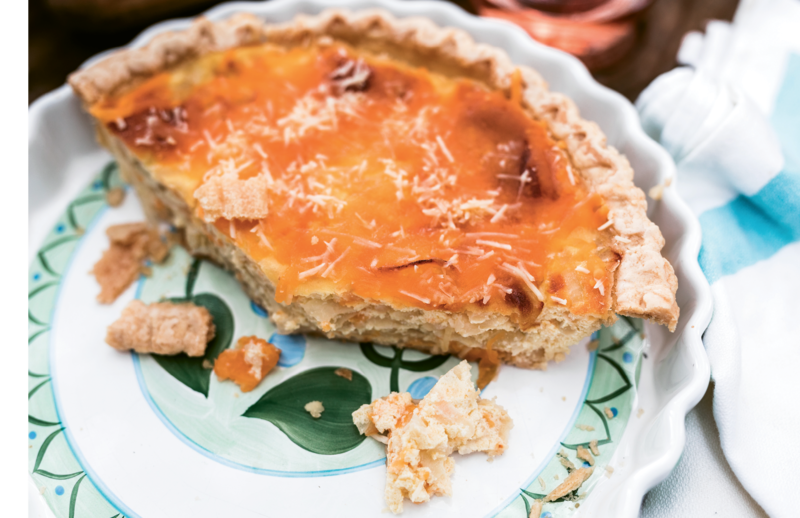 Vidalia onion pie, a satisfying staple passed down through Anne Marie’s family, showcases onions at the peak of their ripeness in late summer, when the bulbs are the sweetest. A salad of chilled black rice, mango, peaches, blueberries, avocado, and honey vinaigrette is a refreshing dish for the end of summer. 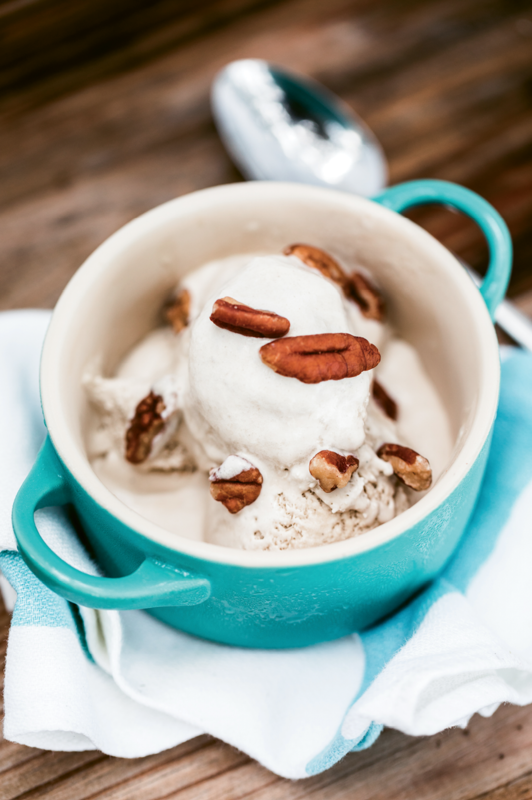 Lavington Farms cane syrup is cooked in an antique kettle, then churned into ice cream. The Hagood family’s river retreat is the oldest home in the area; previously, it was used to house the station for the ferry from Charleston to Rockville. PHOTO: Jimmy Hagood, his wife, Anne Marie, and daughters Catherine and Mary Neill (with granddaughter Louisa) gather with friends on the river. 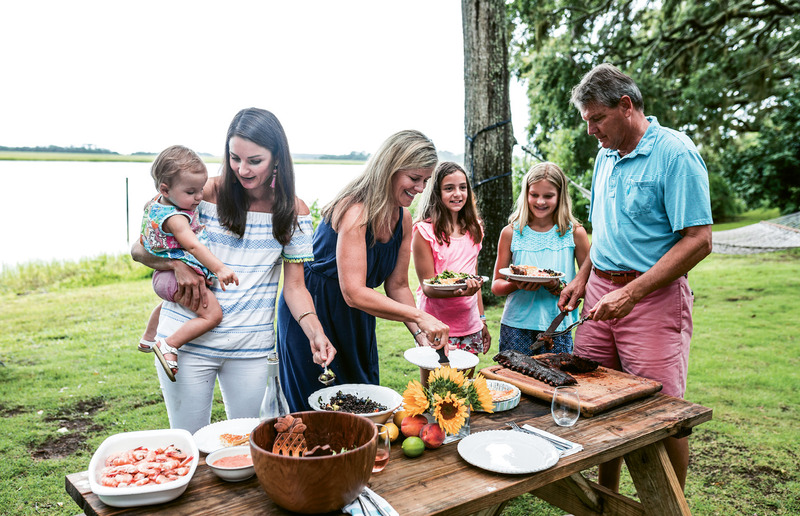 While Charleston has gone hog-wild for barbecue over the past few years, when Jimmy Hagood was growing up here in the ’70s, there weren’t many places to get it. Locals went to Piggie Park on Rutledge Avenue or Rast BBQ on John’s Island or drove further inland. “Heading to Sweatman’s [in Holly Hill] was always a treat,” Hagood says. Despite its rarity in the Holy City (or perhaps because of it), smoking meats became a hobby for Hagood, and by the early ’90s, he was traveling to amateur barbecue competitions across the country. Then in 2002, as Hagood’s talents began earning him championship ribbons, he quit his desk-bound insurance job to start up his BlackJack Barbecue catering company. The business branched off into a specialty product line, Food for the Southern Soul, that is carried in more than 300 grocery stores. With a lineup of goods (including barbecue sauces, mustards, marinades, and a spicy “Pick-Me-Up” Bloody Mary mix) that are cultivated, harvested, and made locally, the purveyor aims to share his reverence for authentic Southern hospitality. “It all centers around people coming together to cook creative menus with good manners,” he says. And for this native son, it’s rooted in Rockville get-togethers. 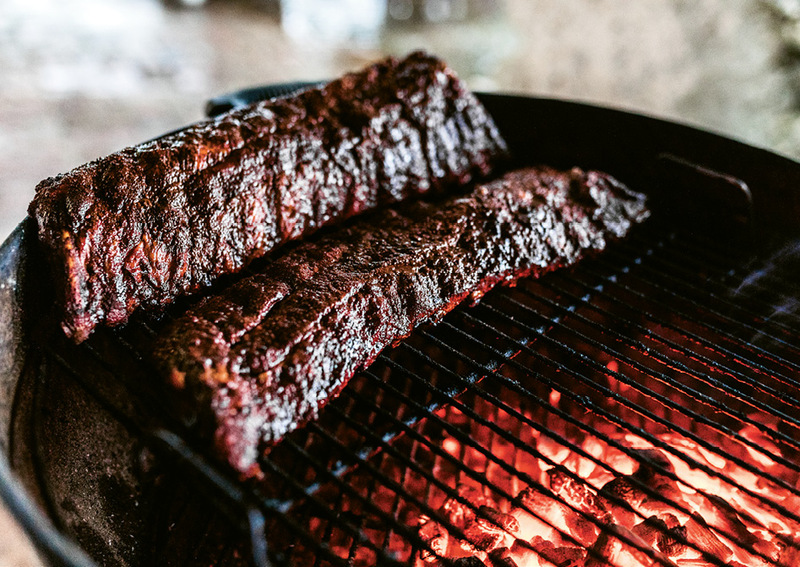 When the midday heat begins to ebb with the late afternoon breeze, Hagood deems the ribs just right, the spicy rub having formed a sort of bark along the outside. “People like to use the expression ‘falling off the bone,’ but in the barbecue world, that is overcooked. I like for the meat to pull down on the bone about half an inch,” he explains, holding a rack by one end and explaining that it should bow but not break. At dinnertime, folks roll in from the river, sun-baked and hungry, and fill their plates. 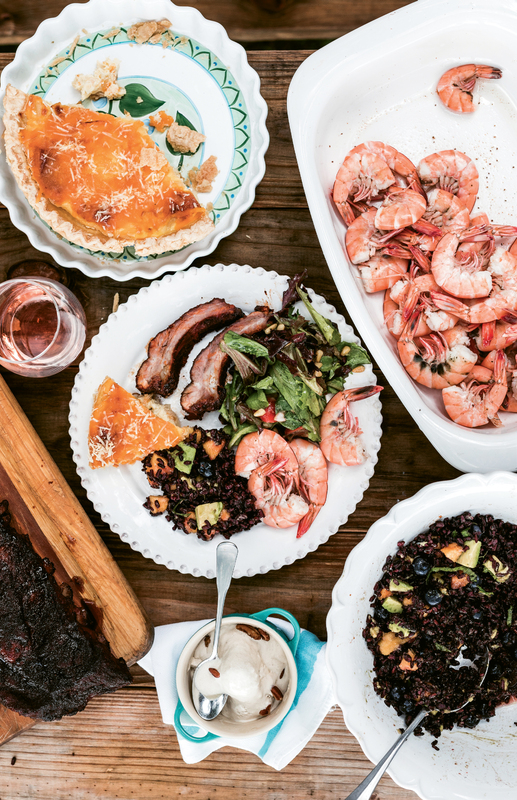 Along with the meat, there’s a green salad, local boiled shrimp and dip, and black rice tossed with blueberries and mango. Vidalia onion pie, a favorite passed down from the Sumter kin of Hagood’s wife, Anne Marie, is bubbling with eggs, cheese, and the summer bulbs. Later, for a sweet sendoff of the season, the crew will dip into ice cream churned with Lavington Farms cane syrup, a glorious amber sauce that’s kettle-cooked and bottled on the family’s ACE Basin farm.